PLO Executive Committee Member Dr. Hanan Ashrawi condemned Israel’s passing of the first reading, of a draft law, that defines Israel ‘as the Jewish and democratic nation state of the Jewish people’ and affirms ‘the right of the Jewish people to self-determination in their historic homeland,’ said a press release issued on Wednesday. 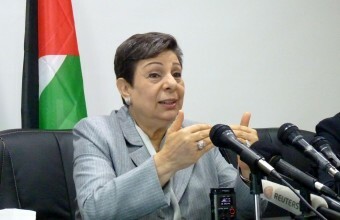 Ashrawi said, according to WAFA, that the proposed legislation is illegal by all measures of international law, and violates the most basic fundamental principles of human rights and democracy that staunchly oppose racism. “Undoubtedly, Israel is working to achieve ethnic purity and prolong the occupation and its ongoing system of apartheid and ethnic cleansing, ridding itself of any responsibility towards the Palestinians and eradicating the right of return for Palestinian refugees,” said Ashrawi. If passed, this bill would deprive the Palestinian citizens of Israel of their economic, political and social rights, turning them into second-class and third-class citizens, she added. “In light of the serious escalation of Israeli efforts to superimpose all of ‘Greater Israel’ on all of historic Palestine, it is incumbent upon all members of the international community to intervene immediately, not just to prevent further deterioration but to also undo the damage and rectify the situation as soon as possible,” concluded the statement.